Scout Comics Announces New 2019 Series in METALSHARK BRO! 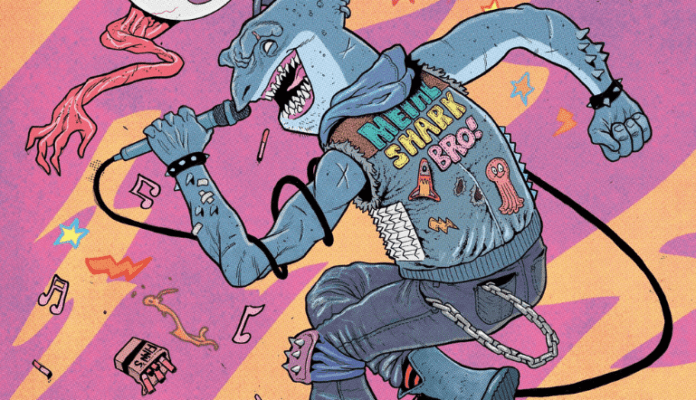 As if the thought of murderous sharks wasn’t enough, now they are summoned by demons and love heavy metal, in 2019’s anticipated series, Metalshark Bro!, from Scout Comics. The upcoming series will arrive in 2019 from the creative team of Bob Frantz, Kevin Cuffe, Walter Ostlie and Shawn Greenleaf. The setting of the story is off the coast of Bali, where sharks are actively looking for a meal. Beelzbra, the nephew of Satan, throws a wrench in mother nature’s plans by turning one of them into a murderous anthropomorphic shark. Wanting nothing more than to be turned back into the happy, swimming shark he was, Metalshark Bro!, must first seek out nine cursed souls on behalf of the demon, before being changed back. Check out both covers for the first issue, including interiors of the first five pages, below.